I was lucky enough to attend a workshop for the Queensland Poetry Festival with poet Ali Cobby Eckermann, held at the State Library. I was battling the flu and hadn’t had the best of days – but the two hour workshop was worth the trip. During the workshop we did a number of writing exercises and contributed these to the group. Ali informed us all after we all spoke for the first time – that the exercise was designed to make us all feel equal. Ali had a way about her that made me feel quite comfortable in her presence. Our writing excercises culminated in a final piece where we again contributed out aloud to the group. I enjoyed hearing the other attendees speak and have the courage to do so. During the workshop I noticed that Ali was quite informative with a number of quotes I had to copy down. After the workshop I attended Ali Cobby Eckermann – A Night by the Fire. I hadn’t visited this space before – although I have been to Kuril Dhagan many times, and will be back to sit around the campfire. Ali spoke so wisely and is a true performer – she had the intimate audience enthralled. I thoroughly enjoyed my afternoon and was truly inspired by this amazing poet / writer. This entry was posted in Uncategorized on August 26, 2017 by mummakrista. Last month my family and I travelled to Cairns for CIAF. I knew that my jarjums would enjoy it and they did. They loved the art exhibition in the terminal liner (although I had to be wary of the two young boys near the art). My daughter loved the pop up art stalls and so did I. (I have a beautiful dilly bag from Moa Island hanging on my wall!) The whole family loved the dancing which I could have watched all day. My small ones LOVED the playground outside of the festival and would have been happy just to have gone their for the 3 days. My only complaint is that I didn’t get to see enough or do any of the art workshops but at the time that was okay because I got to go to two other events that were next level. (I wont be mentioning the Bunnies v Cowboys game because of the score 😦 ). WANDAN Fashion Show – I bought tickets for my daughter (who is 11) and I. We are not fashionistas but love live performances. This show was exciting from beginning to end. The music by DJ Mau Power set the mood as soon as we got there. (There is one track that I found later on by The Merindas that I couldn’t get out of my head). There were 3 dancers including Hans Ah Wang that moved throughout the show – they were hypnotising to watch and full of amazing energy. I was impressed by the sisters & brothers modelling. I loved seeing the designers and felt their pride when they appeared at the end of their set. It was undoubtedly beautiful seeing the Aunty from Mornington Island with their distinctive designs dance with Hans Ah Wang – such a beautiful moment. I also loved the ending where the models and designers all relaxed and let loose for a moment. During the show I could not keep my eyes off the wearable art – the necklaces, the earrings and headpieces. This definitely inspired me to try my hand at weaving this year. I highly recommend the fashion show – it was fantastic! MY NAME IS JIMI – I also took my son and daughter to see My Name is Jimi, a play by Jimi Bani and his family. Seeing his mother, grandmother, brothers and his son on stage was heartwarming. This play had it all – education on Torres Strait Islander culture, humour, dancing – such strong storytelling. It really appealed to both of my children who wont be forgetting the play anytime soon. On my return I also took 3 high school children to My Name is Jimi to the Billie Brown Theatre, South Brisbane for work. I wasn’t sure how they would react but each loved the play and really connected with the story. One of the mothers of the student that I took said that it planted a seed with her child who was hungry for more knowledge of his ancestry. I also enjoyed the play just as much the second time around! This was such a great weekend that I have another girlfriend wanting to come up next year! Hope I get to go! This entry was posted in Uncategorized on April 7, 2017 by mummakrista. 2016 was the first year that I have worked at a high school and like most other employees I have counted down to the holidays. Term 1 was pretty rough but we made progress in Term 2 & 3. Term 4 was relentless and although I hung in there – I definitely floundered. The big reward was easily having 5 weeks off with my 3 jarjums at the end of the year. These holidays saw the mad rush leading up to Christmas and then we went away for a week visiting family where at times 11 little cuzzies played non stop. I enjoyed the madness however it has yet to slow down since I returned home. This week has consisted of a steady lot of visitors which has been lovely but exhausting. I have been playing endless hours of cards on these holidays, and now my 10 year old daughter has joined in. I enjoy her cheeky card banter and little competitive streak! Today even included the rare event of my 3 jarjums and I having a long afternoon snooze, while hubby constructed new trampoline. Kids were also very excited! The best part these holidays is being able to enjoy ‘being’ home. Life was so busy in 2016 that at times I didn’t stop to enjoy my home or really unwind. We rarely got the time to maintain our gardens or do homely jobs. We planted a herb garden a few months ago but since havent got into a regular therapeutic routine of watering the plants or keeping the plants alive! In 2017 I will be keeping more time aside to do more around home and consciously enjoy my time off at home. I plan to ride to school with the kids on occasion and have more time to create nice/healthy meals for the family. I look forward to benefitting from several wise work choices. I think my little family will benefit too from my work life being less stressful. Choosing less stress and consciously planning my weeks = positive start to 2017. This entry was posted in Uncategorized on January 8, 2017 by mummakrista. After a two year break I have returned to work in a school and it has been relentless and challenging at times. Added to this I have three jarjums and although I love being a mother, our lifestyle can be busy, just like any working parents. Ever present in my mind throughout this term has been having an awareness and responsibility of taking care of my mental health. This is to simply keep healthy so that I can continue to look after my family and I. One of my dearest friends gave me a present yesterday, “A Year of Mindful Living.” This book is a collection of ideas and prompts to create everyday mindfulness. The ideas and prompts focus on simple ideas to use your time wisely to create good habits that will lead to a calmer life. My friend (who I have much admiration for) is presently using the prompts and ideas daily and prepares her days with purpose. I am grateful for my friend who has always been so thoughtful and generous towards others but has struggled to put herself first. Her mindfulness is influencing me to be more so and to positively influence others close to me. So these holidays I am really appreciating being home with the kids, everyone unwinding and practising being mindful every day. This entry was posted in Uncategorized on April 4, 2016 by mummakrista. 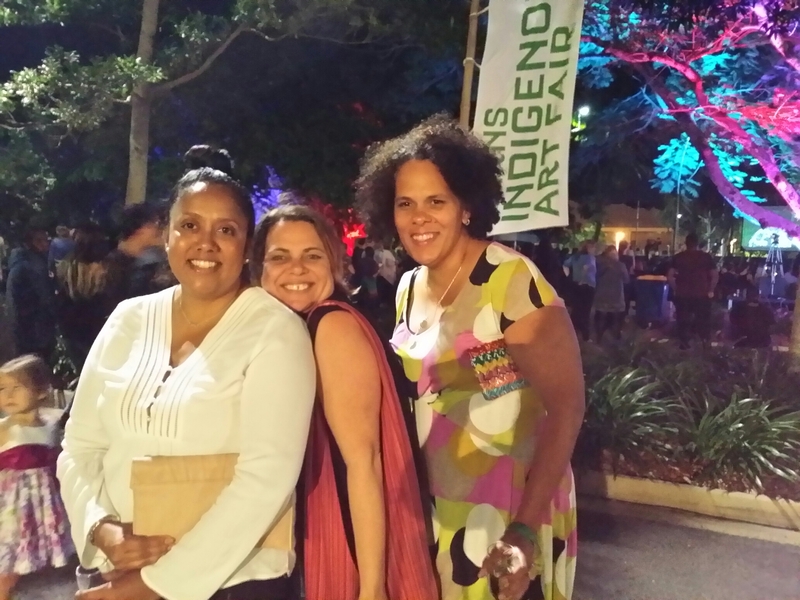 About 6 months ago I became really interested in attending Cairns for the Indigenous Art Fair (CIAF). Cairns and the far north have been a favourite destination for me and my little family but for this visit I was keen for a child free adventure. I had just missed out on attending CIAF a few years back having been in Cairns for a Rabbitohs game. My husband was keen for some one on one time with the kids so it looked like a great plan. Then I thought of a travel buddy and called my dear friend who agreed to come. Upon arrival to Cairns we were relaxed and happy to not be blasted by the heat. We had arranged tickets for the Opening party and it was a fantastic event. The crowd was huge and abuzz with excitement. The artwork included some amazing work that deserved a second viewing away from the crowds. The venue inside and out was superb and the fireworks were deadly. 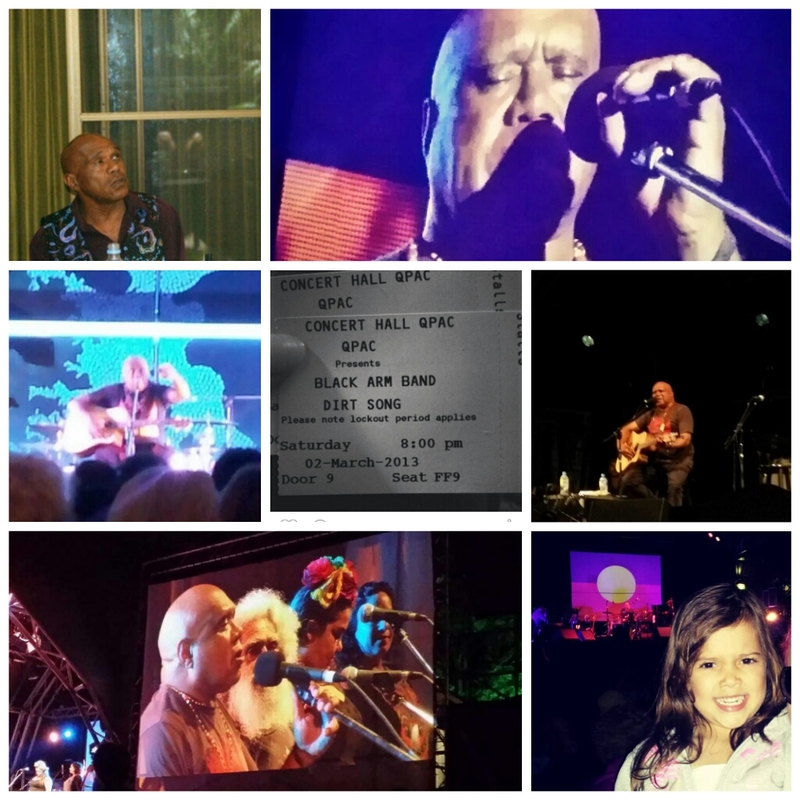 I loved watching the dancers and then Christine Anu, Mau Power and the legendary Archie Roach, but loved the crowds reaction equally. It was deadly running into old friends too from Brisbane. We spent most of the next day visiting the Cairns Regional Art gallery, Centre of Contemporary Arts (COCA), Canopy Arts and Umi Arts. Viewing this art made me excited to attend the Fashion Show that night but unfortunately it was a sold out event. I have heard some rave reviews about the Fashion Show and will book tickets early next time. On the Saturday after a lovely walk on the Esplanade and breakfast and a much needed siesta, we attended Fogarty Park for Big Talk One Fire. We checked out the stalls and then sat down and enjoyed the music. I loved the huge crowd and number of families that turned up. Saturday night included attending an exhibition launch at Canopy Arts. I particularly liked the artwork of Roy McIvor and Danny O’Shane. I am also a new fan of the Italian restaurant on the corner of the Esplanade! We returned to the Cruise Liner Terminal on Sunday and took our time checking out all of the pop up stalls and of course buying a few small presents for the kids. Although some of the artwork was out of my price range, it was nice to pick up a few reminders of the fair. 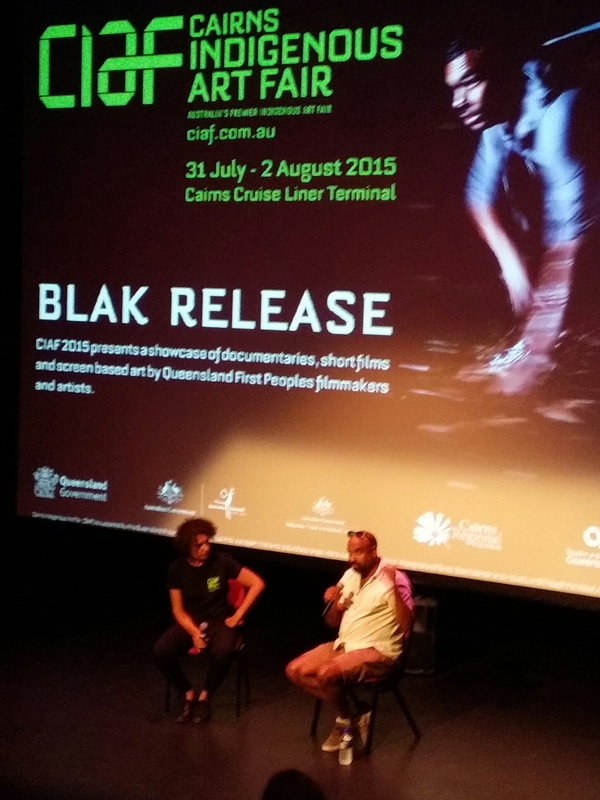 On the Sunday afternoon we attended Blak Release film festival at the COCA. I love the theatre it was shown in being smaller in size. Of special note was two films by John Harvey, ‘You Turn,’ and, ‘Real Man’. Both short films were well acted and directed with solid storylines. I really enjoyed the child free time to feel and be myself for a few days attending a wonderful Indigenous Arts event. I enjoyed getting ready and even putting makeup on. It certainly beats madly getting ready in the last 5 minutes prior to leaving at home (because the kids always come first). I enjoyed sleeping in, eating every meal without disruption and being able to kick back and have a couple of drinks (which I rarely do these days). I enjoyed sitting quietly on the balcony checking out the scenery and having many laughs and a few late nights. We definitely made the most of our few days in Cairns. CIAF certainly made an impression on me. I am wondering just how I can get paid to visit events like CIAF in the future! This entry was posted in Uncategorized and tagged CIAF, holiday, Indigenousart on August 9, 2015 by mummakrista. I am a bit sad that I did not see Uncle Archie Roach perform at Musgrave Park Family Day but that is life with young children. I have seen Uncle Archie perform many times throughout the years and find it hard to miss him performing. One great memory was a Black Arm Band performance at QPAC (Queensland Performing Arts Centre) in Brisbane where Uncle Archie and others were amazing! My daughter (9 years old) has enjoyed Uncle Archie’s performances with me at GOMA (Gallery of Modern Art) in Brisbane although our $17 cheese platter did not last long. We also attended the first Boomerang Festival near Byron Bay in 2013 where Uncle Archie was the highlight. I can remember being freezing cold there too but that didn’t take away from his soulful performance. I have seen Uncle Archie several times at the Woodford Folk Festival. An outstanding memory is of a magical morning having a cup of tea with Uncle Archie and his late life partner at my mum’s house with my two excited sissy’s. That is definitely a hard memory to top. My daughter again came along to the Woodford Folkie ’14 and enjoyed his performance. I am hoping to add to these memories this year!